AUSTIN – Texas is getting closer to revealing its true identity after the first two games of the 2018 season, Longhorns Head Coach Tom Herman said Monday. And he expects Texas to take another step forward when they host No. 21 USC Saturday in one of the Horns most anticipated home games. Herman, speaking to the assembled media in his regular weekly Monday availability, outlined the progress his team made from its week one loss at Maryland to its 28-21 win last Saturday over a tougher-than-expected Tulsa team. “There were a lot of really, really positive things,” Herman said about the victory over Tulsa. “We played unbelievable red-zone defense in that game, and we scored on our opening possession, which especially important after coming out as slow as we did in the first week. And then we had our two final possessions on offense, 11 and a half minutes of having the ball and making sure that you ensure the victory." Getting from a continual work in progress to a more polished product is right in front of the Horns with their huge home test this weekend. The defense was supposed to be one of the Longhorns’ strengths this season, yet has just one sack, two quarterback hurries and 10 total tackles for a loss over the first two games against offenses that are ranked 35th and 77th in the nation, respectively. “We got to get more pressure on the quarterback,” Herman said. “And we have had a lot of discussion of that over the last 48 hours or 36 hours – our four-man pass rush has to be better, we got to improve. We have also got to contain the quarterback better. We gave up some big plays, some big third and fourth down conversions on quarterback scrambles too." There's a method and reason to that in the early going, according to Herman, as Texas meshes its young talent with a veteran core. "So there also has to be a fine line when you're as young as we are in the secondary,” Herman added. “The easiest way to pressure a quarterback is to blitz and, but you're also leaving a young secondary maybe susceptible to some big plays there. So, it's a balancing act." Don’t think for a second that the Longhorns (1-1) were satisfied or even partially satiated by the win over Tulsa – this is a team that wants, and expects, more and has the talent and work ethic to be better. Herman said freshman running back Keaontay Ingram will likely miss Saturday’s game with a knee injury but was not expected to be out “extremely long-term.” Ingram suffered the injury in the second half of the win against Tulsa. Herman also said that center Zach Shackelford will also miss this week’s game, and likely next week’s conference opener at home against TCU, with his ankle injury. “Shack will get out of the boot on Wednesday and then progress, and we'll see kind of week by week,” Herman said. Cornerback Kris Boyd woke up with some neck pain on Sunday, so he did not practice on Sunday, but is expected back for practice Tuesday. John Burt is still out with a foot inury. And safety Brandon Jones should do a little bit in practice this week, Herman added. There was also good news concerning offensive lineman Patrick Hudson, who had to be taken to the hospital on Wednesday with a heat-related affliction. “His IV is out, and his levels are trending back to normal each and every day,” Herman said about Hudson. 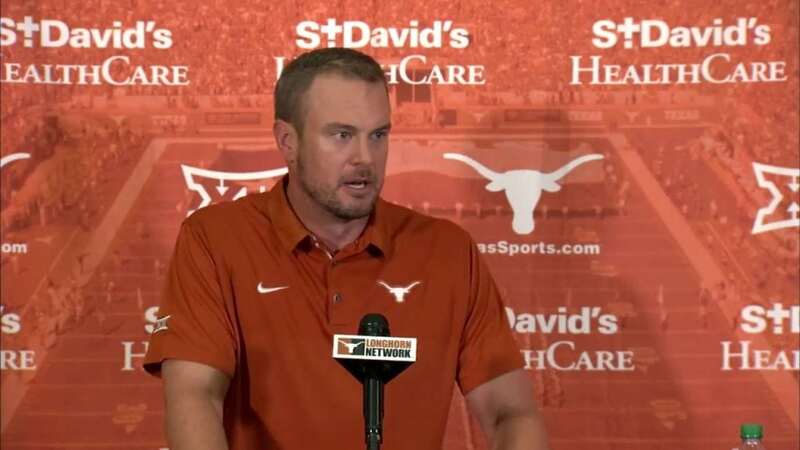 After Texas first win of the season, Herman reiterated that sophomore quarterback Sam Ehlinger continues to elevate his play and take strides with an impressive performance. “Sam played really, really well. Really well, " Herman said. "(He) managed the game well, checked us into some really good plays versus blitz. If he had to have a few of those read plays back, I think he probably would have handed the ball off. But other than that, he played really well." A year ago, Ehlinger was 21-for-40 passing for 298 yards along with two touchdowns and two interceptions in a 27-24 overtime loss. He added 10 rushing yards on 19 carries — an area that could improve this week, and will likely need to for Texas to prevail.